The Camino de Santiago, depending a lot on the routes, can become a real adventure. But in this case, it could even be an extreme sport. Jose de la Hoz, current mayor of the town of Bareyo, belonging to the Autonomous Community of Cantabria, has asked the Spanish counseling of Tourism to install a Tibetan bridge on the Camino de Santiago, specifically on the estuary of Ajo. A Tibetan bridge is one of the simplest structures that can be considered as a bridge. They are composed of two strings that make the function of the bridge and, sometimes, nets on the sides to improve their safety, plus a composed base tables. 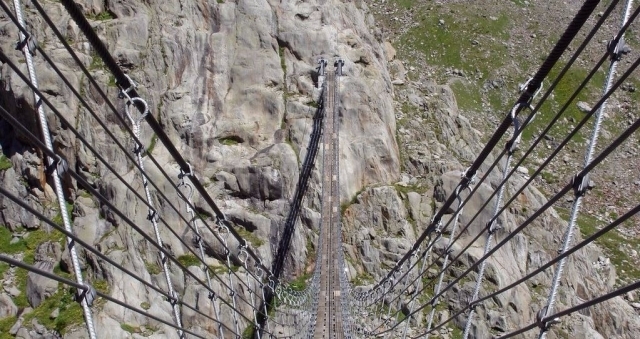 Presumably this bridge will meet all safety measures and assume a hobby for all fans of extreme sports do the Camino. The bridge would link the towns of Bareyo and Arnuero. The counselor of Tourism, Francisco Martin, has advanced that the placing of the bridge will be consider, which would not only serve as such, but could be a major tourist attraction. ¿Habrá quien no termine el camino y dé media vuelta? Bua, sería tremendo, menuda estampa! !